Like ‘Cards Against Humanity’ but for Chromecast! 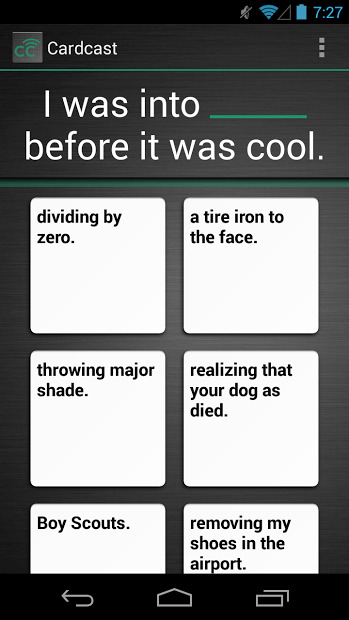 Cardcast is an open-format, card-matching party game for the Google Chromecast. The objective of the game is to respond to a question or statement that has had a certain word or phrase removed by playing one of the cards in your hand that contains a different random word or phrase. The idea is to make the worst combination possible, something that would make your mother want to never speak to you again. If you still want to try it out, here’s how. The game will start when enough players have joined the session and pressed their ready buttons (the game currently requires 2 players to start, but you really need at least 3 players to start having fun. In this version of the game you can play with bots) A ‘judge’ is chosen and draws a call, they’re assigned to read the card on display for all to hear. Then players, submit their responses that match or complete the call. After that, the judge chooses the best answer and awards the player that played it with one point or any thing you guys agreed before. Rinse and repeat.